Scotty Moore died yesterday (June 28, 2016) – R.I.P. Scotty Moore died yesterday at the age of 84. Winfield Scott “Scotty” Moore III (December 27, 1931 – June 28, 2016) was an American guitarist and recording engineer. He is best known for his backing of Elvis Presley in the first part of his career, between 1954 and the beginning of Elvis’s Hollywood years. He was ranked 29th in Rolling Stone magazine’s list of 100 Greatest Guitarists of All Time in 2011. He was inducted into the Rock and Roll Hall of Fame in 2000 and the Memphis Music Hall of Fame in 2015. One of THE greatest rock’n roll guitarists of all time! 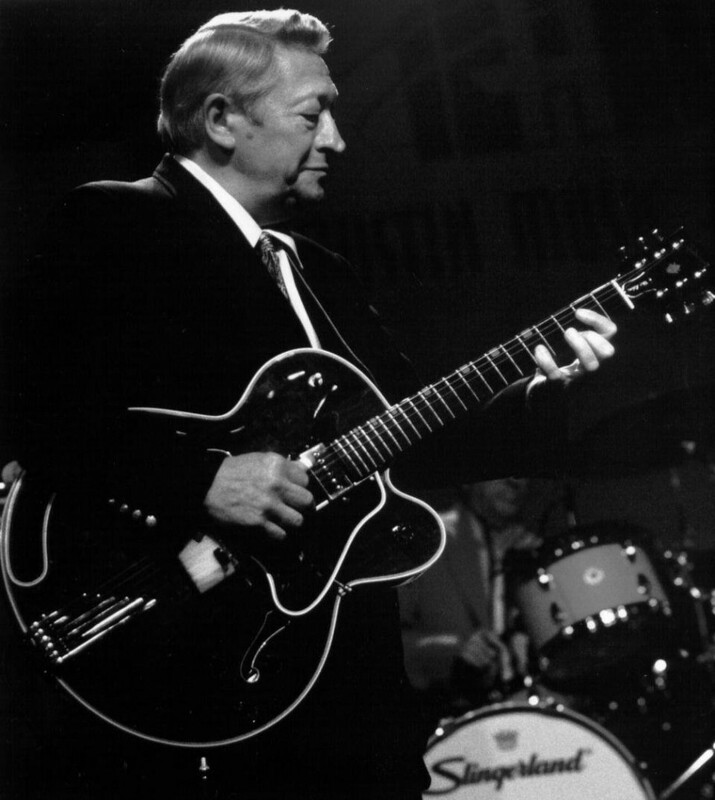 Scotty Moore was born near Gadsden, Tennessee. He learned to play the guitar from family and friends at eight years of age. Moore’s early background was in jazz and country music. A fan of guitarist Chet Atkins, Moore led a group called the “Starlite Wranglers” before Sam Phillips at Sun Records put him together with then teenage Elvis Presley. Sam Phillips believed that Moore’s lead guitar and Bill Black’s double bass were all that was needed to augment Presley’s rhythm guitar and lead vocals on their recordings. In 1954 Moore and Black accompanied Elvis on what would become the first legendary Presley hit, the Sun Studios session cut of “That’s All Right (Mama)”, a recording regarded as a seminal event in rock and roll history. Moore played on many of Presley’s most famous recordings, including “That’s All Right”, “Good Rockin’ Tonight”, “Milk Cow Blues Boogie”, “Baby Let’s Play House”, “Heartbreak Hotel”, “Mystery Train”, “Blue Suede Shoes”, “Hound Dog”, “Too Much”, “Jailhouse Rock” and “Hard Headed Woman”. Moore and the Blue Moon Boys also perform (and have additional small walk-on and speaking roles) with Elvis in three of his movies (Loving You, Jailhouse Rock, King Creole and G.I. Blues ) filmed in 1957, 1958 and 1960. 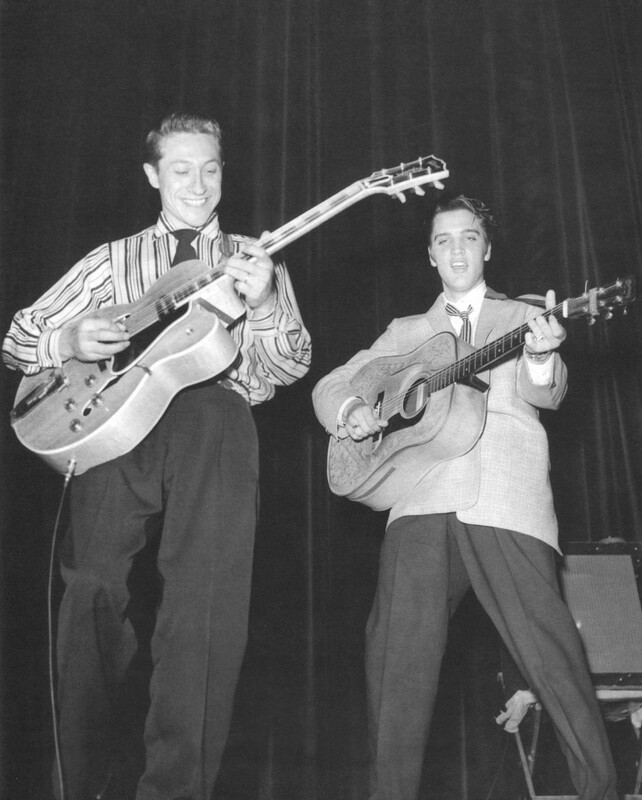 Scotty Moore reunited with Fontana and Presley for the NBC television special known as the ’68 Comeback Special, again with his Gibson Super 400 which was also played by Presley.